After filling the inside of the bag with candy, fold the opening as shown above. You can trim away the longer flap that is showing to the right, or leave as-is. Use a dab of quick drying glue along the opening's inside edge and hold in place until dry. For the pom-pom top, you will need a piece of cardboard (or paper that has been folded, etc.) that measures about 2" wide. Next, begin wrapping desired Doodle Twine around the cardboard approximately 40 times. Slide the twine off as one piece. Take a small piece of twine and tie in the middle of the loops. Cut all of the loops in half and fluff to form the pop pom. Glue to the top of the treat bag. 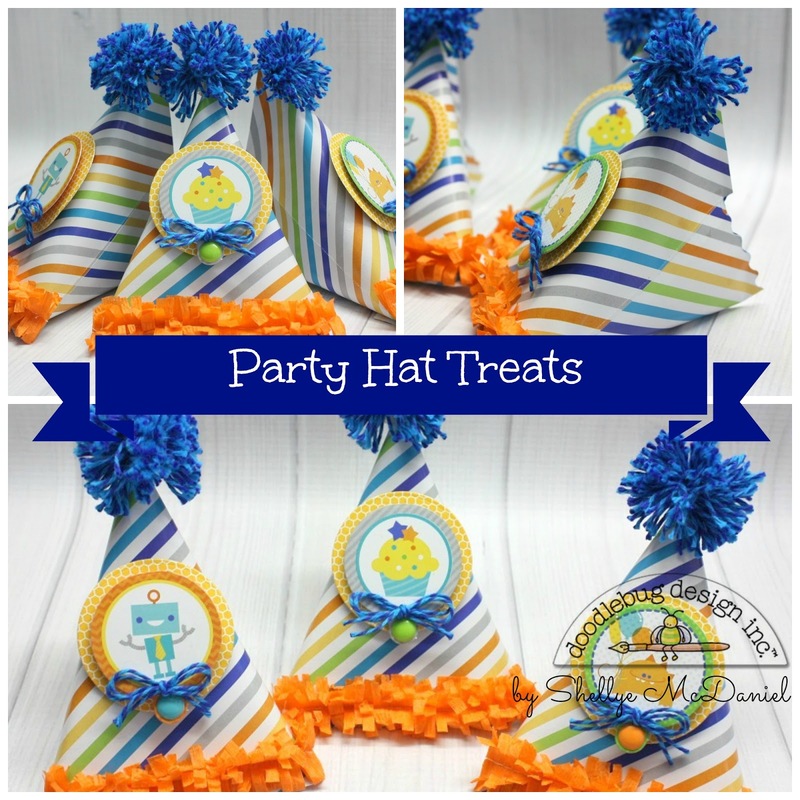 The bottoms of the treat bag hats were decorated in some orange crepe paper that I stitched together. Just fold a piece of crepe streamer in half and then in half again; stitch down the middle and then cut the sides into slits. The fronts were decorated with punched circles layered with Pixie straw toppers and a Sprinkles enamel dot. I have made this same style treat container in the past with a square of paper...this is so much easier and a lot less time-consuming. Fill a basket with them and you have an instantly colorful centerpiece! I hope you've enjoyed this little tutorial...thanks for stopping by! Great project, great tutorial and great photos too!!! Wow, what a clever idea! How cute! OK, OK, I am just not even sure where to begin in my gushing over this project!! Everything about it is amazing - from the cute Doodlebug treat sack she started with to the twine pompom to the excellent pics and how-tos!!! I am floored and also unlike some other projects because of the excellent how-tos I want to go see if I can create some of these!! That is what I love about Doodlebug and the Design Team - makes it easy to create masterpieces!! Thank you, Thank you SOOOOOOOO much for all that each of you do!!!!! Kudos to Shellye for this adorableness!! Oh how adorable!!! Love the Pom pins too!! !